Last week a conference at University College London made me reconsider what universities are, and what they might be. These thoughts seem so vital right now that I’m interrupting the narrative of my trip to Congo to share them. But for me a larger theme ran through it all: the place of the university in the world. 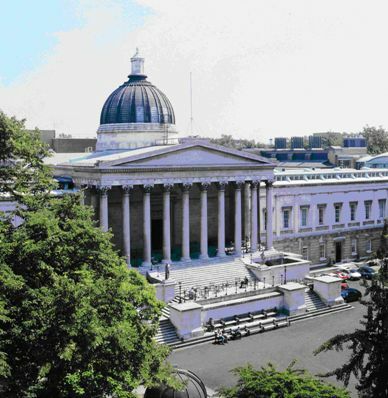 Established by Jeremy Bentham in 1826, UCL was the first university in Britain to admit women, and the first to devote departments to such practical subjects as engineering and economics. The idea of applied research was then new. The question that bugs me is How? 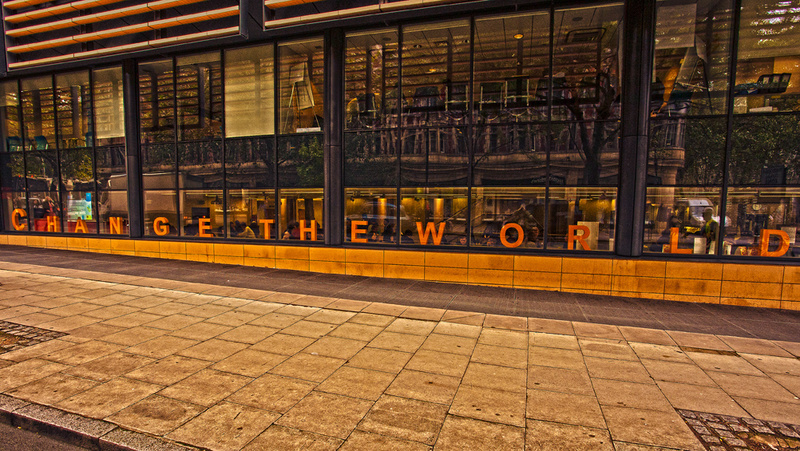 Specifically, what kind of world do we desire? How do we go about the task of bringing this world into alignment with it? And what can academics contribute to the task? The conference threw up several answers to these questions for me. But they weren’t always consistent with each other. 1. Take time out to observe the world. 2. Catalogue where your work engages with global problems. 3. Build groups of friends and collaborators around global challenges. A self-described “born again” social media enthusiast, Finkelstein (who blogs here) also pointed to the potential of the internet to democratize knowledge, breaking down barriers between academia and the public. Perhaps by combining the skills of experts with the enthusiasm of a connected public, we could bring about really revolutionary change in combating poverty, hunger, and ill-health. David Price, the Vice-Provost for Research, pointed out a potential flaw in this formula, and made the case for a quieter sort of revolution. The story demonstrates what great harm unscrupulous researchers can inflict, and how the media can interfere in communication between scholars and public. The greatest contribution researchers can make to society, Price argued, is through increasing the integrity and credibility of science. It’s due to a lack of trust in science that a question mark hangs over the issue of human-induced climate change in the minds of politicians and the public. All of us in academia contribute to or detract from the credibility of the scientific community — even through the most mundane details of our professional work. Don’t exaggerate the significance of your findings, Price exhorted us. Don’t extrapolate beyond the range of your data. And don’t abuse the peer review system — for example by axe-grinding behind the cloak of anonymity. A culture of integrity in scholarship, he implied, could work wonders for society — rather as the personal decency of James Stewart’s character in the film It’s a Wonderful Life ramified to the benefit of his community. Most of the world’s problems aren’t the result of widgets or gadgets failing, but the result of people failing, said Maurice Biriotti, another presenter. After a “three o’clock in the morning moment” Biriotti resigned from his lecturing job in Literature to establish a consulting firm. SHM Productions provide their clients with information on what the public thinks about given issues; help effect change when a company is encountering opposition among its rank and file; and repair corporate disputes — for example when two multinationals sign a merger agreement and then have a falling-out. The firm was held up as an example at the conference, and it’s surely an impressive illustration of how academics can apply their skills outside of the university. In the process, academics may contribute to changing the world, all right, but it’s liable to be change of a regressive sort! Or, at least, a defence of the business as usual in the industrialized countries that spells disaster for the world: a continuation of global inequities and ecological decline. Observe, catalogue, collaborate, and communicate, yes. What’s crucial, if the university is to fulfil its promise to change the world for the better, is that it maintains independence from the interests of commerce just as much as it does from those of the church and party politics. It must be a place where the question, What sort of world do we desire? can be entertained freely. For most of human history, philosophical questions like this one have been framed in religious terms. The independent social space that reformers like Bentham carved out for the university is precious. And yet forging a new and better world will likely require a kind of inspiration that, until recently, has been the preserve of religion. Unless there is some kind of spiritual revolution that can keep abreast of our technological genius, it is unlikely that we will save our planet. A purely rational education will not suffice. Before the measles outbreak, the Lancet had retracted the paper, and exposed the article’s findings as fraudulent. But the idea of the danger posed by the vaccine remained out there, and the damage was done. George Monbiot recently criticized British academia for accepting money from corporations whose interests are intrinsically oppositional to the values that universities should be standing up for. One such contradiction at UCL is the sponsorship of its Institute for Sustainable Resources by BHP Billiton, one of the world’s largest coal-miners. Karen Armstrong (2006). The Great Transformation: The world in the time of Buddha, Socrates, Confucius, and Jeremiah. New York: Random House (p. xi). This entry was posted in climate, education and tagged capitalism, change the world, climate, religion, research, revolution, science, university. Bookmark the permalink.